A line of youths at a dance occasion holding clubs and ambatch shields. Dances were frequent events, which provided the main opportunity for youths and girls to socialise together. Morton, Chris. 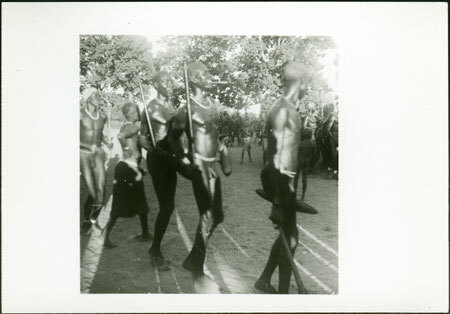 "Mandari dance gathering" Southern Sudan Project (in development). 03 Jan. 2006. Pitt Rivers Museum. <http://southernsudan.prm.ox.ac.uk/details/1998.97.510.2/>.